Some details may be found on Wikipedia sites but, this data is always suspected as it is placed by individuals who are not always 100% accurate. The National Archives have a huge collection of railway documents and a search through the site is well worth the effort. Tracking Railway Archive Project (TRAP) is an attempt to pull all sources of railway information together www.trap.org.uk/ managed by The Railway & Canal Historical Society. 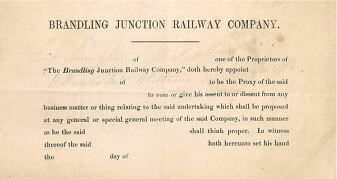 There is a list of unbuilt railways being compiled by Sandy Ralph of the Railway Print Society (RPS). This repository, formerly known as the Public Record Office, contains the principal records of the railway, canal and associated companies which came to be nationalised in 1948 (class RAIL) and of the British Transport Commission, Railway Executive and British Railways Board (class AN). Class AN also contains the records of the Road Haulage Executive, Road Passenger Executive and Docks & Inland Waterways Executive; also British Road Services (to 1968) and some records of the Transport Holding Company. The central records of the National Bus Company, 1968-91, are held at class FH. The railway records include administrative and staff records and timetables; and there are canal administrative records (records relating to some navigations are held in other collections in the PRO). Maps, plans and photographs are found in these collections and elsewhere. The former British Transport Historical Records Library contains printed books and pamphlets (class ZLIB) and periodicals (class ZPER) covering the period 1694-1982, much of it issued by operators themselves; and the private collection of W. E. Hayward relates mainly to minor railways. The PRO Library (open access) includes Acts of Parliament, a strong collection of books and periodicals on local history, and some railway periodicals. The National Archives also maintains the National Register of Archives (listing documents in other collections) which can be searched online. Access by public transport: Kew Gardens station (National Rail/London Underground). National Archives of Ireland: Bishop Street, Dublin 8, Republic of Ireland (00 353 1 407 2300). The archives here most likely to be of interest to transport historians are those of the Office of Public Works which from its establishment in 1831 took various responsibilities for inland waterways, roads, harbours, and supervision of railways. National Archives of Scotland: HM General Register House, 2 Princes Street, Edinburgh, EH1 3YY (0131 535 1314) Scottish Railway Archive at West Register House, Charlotte Square, Edinburgh, EH2 4DJ. You are strongly advised to telephone beforehand to check the location of the records you are interested in. For more details of the collections, choose 'The Collections' from the NAS home page, then select Transport Records. The Scottish Railway Archive contains official records of Scottish railway companies and their canal and shipping constituents, including minutes and reports, letter books, deeds and agreements, circulars, locomotive, rolling stock and civil engineers records, station traffic books, accident reports, and staff records. The NAS also holds an important collection of specialised books and periodicals on transport subjects, mostly inherited from the old railway companies and dating back to the 1840s, as well as timetables, publicity material, engineering and architectural drawings and photographs. National Monuments Record Centre: Kemble Drive, Swindon, SN2 2GZ (01703 414600). Headquarters of the Royal Commission on the Historical Monuments of England (in the former Great Western Railway works general office building); holds extensive pictorial records of England's built heritage, including Rokeby collection of railway station photographs and Aerofilms and other aerial photographic cover. Search room also in London. Images are commercially available from Heritage Image Partnership. Access by public transport: Swindon station (National Rail) nearby. Portcullis Archive Catalogue: House of Lords Record Office, House of Lords, London, SW1A 0PW (020 7219 3074). This is an electronic catalogue containing descriptions of around three million records held by the Parliamentary Archives. Contains records of Parliamentary proceedings on the Private Bills which were the normal means by which canals, turnpike trusts, railways, harbour authorities and similar undertakings sought to be incorporated and given powers to construct and operate their works. Public Record Office of Northern Ireland: 66 Balmoral Avenue, Belfast, BT9 6NY (028 90 251318). Includes records of the Ulster Transport Authority and constituents (including Belfast Corporation Transport and the Northern Ireland Road Transport Board) 1820-1976, together with other items relating to railway companies received as private deposits, and of the Ministries of Commerce and Home Affairs (later, Development), having responsibility for transport. The Cooper collection also contains some relevant material. Transport for London Corporate Archives: 7th floor Windsor House, 42-50 Victoria Street, London, SW1H 0TL corporatearchives@tfl.gov.uk . Company archives for London Transport, its predecessors and successors.